Tickets: £15 in advance; £17 at the door; Child/student £5. 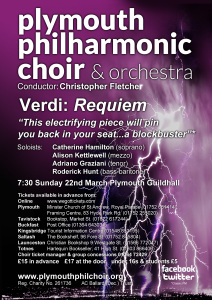 For our spring concert the choir will be performing Verdi’s Requiem. The bicentenary of Giuseppe Verdi’s birth was in October 2013. The work, premiered in 1874, is of such dramatic force, encompassing every extreme of emotion that the electrifying effect is almost overpowering. Even so, it isn’t so much Verdi the angst-ridden Catholic (he was in fact a spiritual agnostic), as Verdi the opera composer, and at the time he was criticised for essentially writing an opera in disguise. With its thunderous evocation of the Last Judgment and urgent prayers for deliverance, Verdi’s 1874 masterwork has a power that has transcended time and creed. In 1943 and 1944, prisoners at the Theresienstadt concentration camp performed the Verdi Requiem for their captors, envisioning its “day of wrath” not in eschatological terms but as the historical moment when the Nazi state would be destroyed, as one survivor wrote, “for the cause of human justice”. This performance was also an attempt to symbolically communicate the circumstances at the camp to a visiting International Red Cross delegation in 1944. Music from the Requiem was sung at the 1997 funeral of Diana, Princess of Wales. In 2011, Oper Köln premiered a full staging by Clemens Bechtel where the four main characters were shown in different life and death situations: the Fukushima nuclear disaster, a Turkish writer in prison, a young woman with bulimia, and an aid worker in Africa. Giuseppe Verdi (1813–1901) was one of the few composers whose genius was recognised while he was still alive. His reputation as the greatest of all Italian opera composers is beyond dispute. Giuseppe Fortunino Francesco Verdi was born in October 1813, in a village near Busseto, which was then a part of the First French Empire. 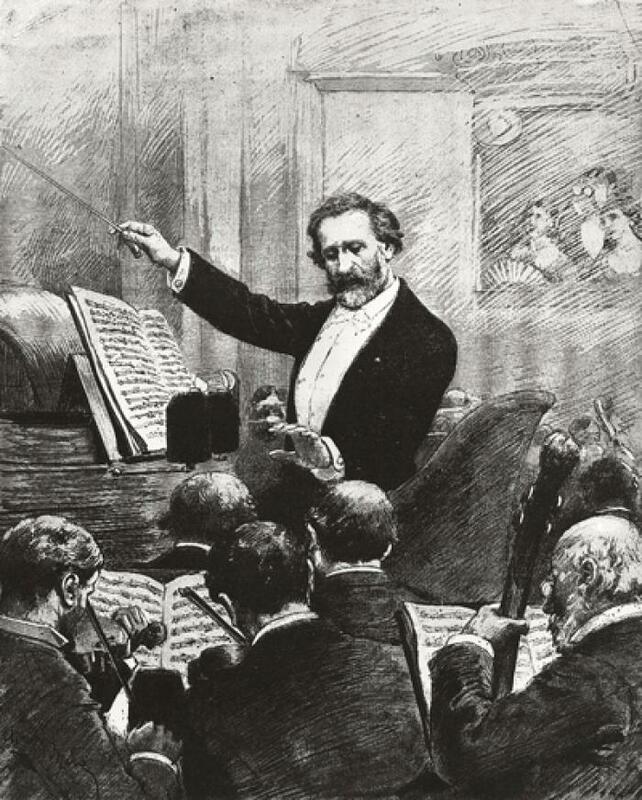 Verdi’s “good disposition” as a student of music led him to attend music school in Busseto in 1823, and in 1825 he was made assistant conductor of the Busseto orchestra. Having been taught the fundamentals of composition and instrumental proficiency, he found a benefactor in Antonio Barezzi. Verdi’s dream was to enter the Conservatory in Milan but, when he arrived there, he was told he was two years over the age limit. Rather than return home, Verdi pursued his studies independently. 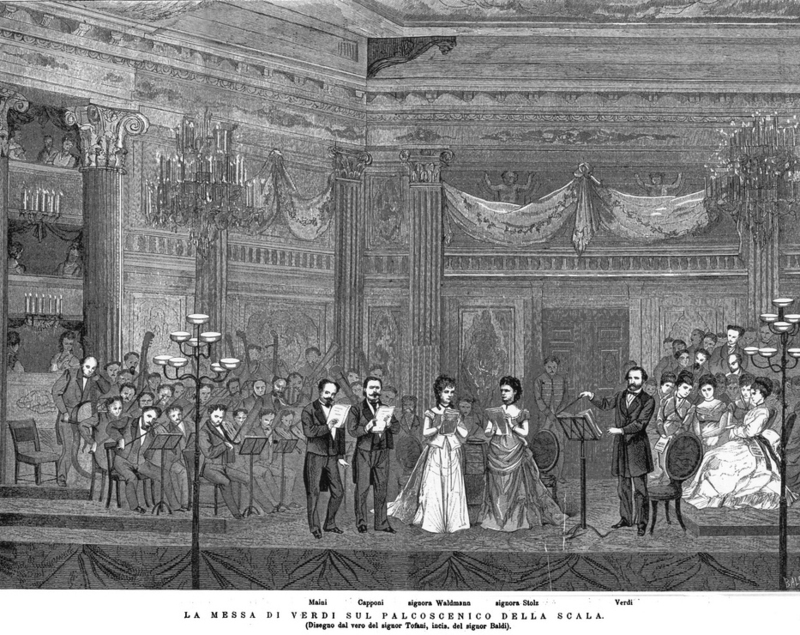 It was in Milan that Verdi discovered opera, and he eagerly absorbed as many performances as he could attend, thus laying the groundwork for a future in theatre music. Barezzi invited Verdi to be his daughter Margherita’s music teacher, and the two soon fell deeply in love and married. Margherita gave birth to two children, Virginia and Icilio. It was in this initial period of wedded bliss, at the tender age of twenty three, that Verdi began to compose his first opera Oberto. Soon though, tragedy struck; both his children died in infancy and, shortly afterwards, Margherita died aged only 26. 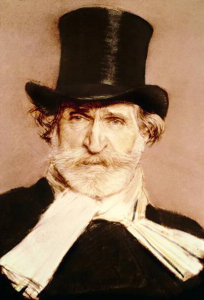 Verdi was devastated by their deaths which occurred as he began work on his second opera, Un Giorno de Regno (A One-Day Reign). Un Giorno, which was, ironically, a comic opera, was a complete flop. With his entire family taken from him and a failed opera hanging over his head, Verdi vowed to end his career before it had even begun. He was convinced by the impresario at La Scala to give it one more try with Nabucco, a libretto telling the story of the Israelite plight at the hands of the Babylonian king, Nebuchadnezzar. The opening night of Nabucco was nothing short of a triumph. The Italians, who were living under Austrian rule, found a new hope in their native son, and Nabucco marked the beginning of Verdi’s eternal fame. Verdi spent the next decade writing prolifically and battling the artistic censorship of the Austrian rule. Around 1851, when he was 38, Verdi became romantically involved with Giuseppina Strepponi, a soprano who had been the jewel of many of his operas, from Nabucco onward. He and Giuseppina lived together (a highly scandalous practice in the eyes of many) for nearly nine years before finally marrying in 1857. It was around the time of his blossoming romance with Giuseppina that Verdi wrote and premiered Rigoletto – one of his greatest masterpieces. Rigoletto ushered in a new era for Verdi’s music as he created one masterwork after another: Il Trovatore, La Traviata, and La forza del destino, to name a few. By this time, Verdi had become so famous, it was said that a letter addressed simply to “G. Verdi, Italy” would make it into the composer’s postbox. His unyielding nationalistic pride made him a true icon to the Italian people, not only musically, but politically. 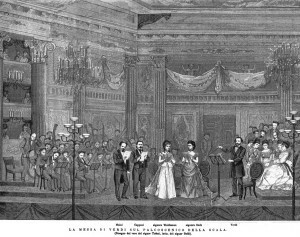 At the close of each performance of a Verdi opera, the house shook with shouts of “Viva Verdi!” The shouting would continue until the crowd was forced from the building at which point, they would take to the streets, still shouting again and again into the night “Viva Verdi!” They weren’t merely wishing long life on their national hero. “Viva Verdi” had become a secret code for the anti-Austrian current that was surging through the Italian people. After Italy was unified in 1861, many of Verdi’s early operas were re-interpreted as Risorgimento works with hidden Revolutionary messages that probably had not been intended by either the composer or librettist. Beginning in Naples in 1859 and spreading throughout Italy, “Viva V.E.R.D.I.” was an acronym for Viva Vittorio Emanuele Re D’Italia (Viva Victor Emmanuel King of Italy), referring to Victor Emmanuel II, then king of Sardinia. 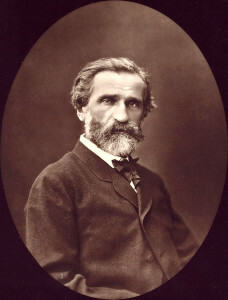 Verdi suffered a stroke on 21 January 1901. He gradually grew more feeble and died nearly a week later, on 27 January. Arturo Toscanini conducted the vast forces of combined orchestras and choirs composed of musicians from throughout Italy at Verdi’s funeral service in Milan. To date, it remains the largest public assembly of any event in the history of Italy. While Giuseppe Verdi is perhaps known most widely for his operatic masterpieces, it would be foolhardy to hail the Verdi Requiem anything other than a masterpiece. Verdi’s Requiem is the composer’s only large-scale work not written for the stage, and it marked a transitory point in Verdi’s life—from the heyday of one wildly successful opera after another into the relatively quiet, twilight years of his older age. 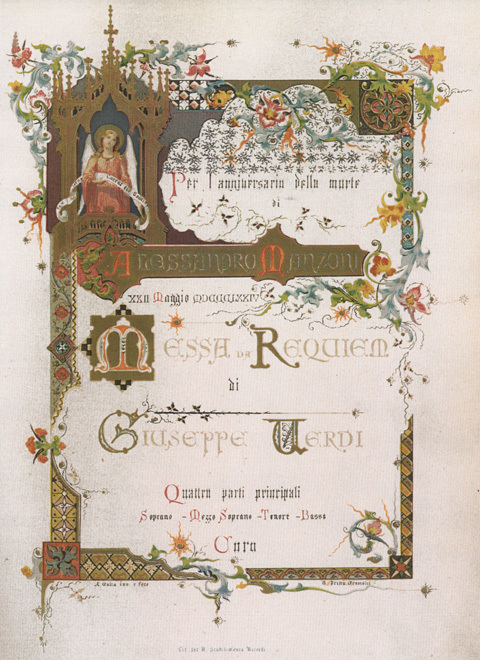 While Verdi officially began working on his Requiem in 1873, a small portion of it had already been composed back in 1868. 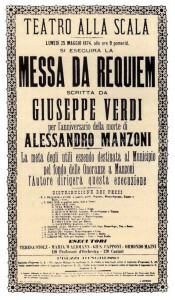 Operatic great Gioacchino Rossini had just passed away and Verdi took it upon himself to commission a collaborative requiem to honour the composer’s memory. He began the process by providing a Libera me (Deliver me) to the effort. A year later, the Messa per Rossini was complete, with thirteen composers having contributed their work, squabbling and backstabbing all the while. Despite the fact that the composers’ lack of camaraderie meant the piece was ultimately poorly put together, the premier performance was scheduled for the one year anniversary of Rossini’s death. For one reason or another, for better or for worse, the premiere was cancelled and the piece was all but forgotten. More than one hundred years later, in 1988, the Messa per Rossini finally got its moment in the spotlight. Of the thirteen contributing composers, the only familiar name on the programme was Giuseppe Verdi’s. Disappointed with the fact that the mass for Rossini had been all for naught—musically and socially—Verdi kept returning to his Libera me, convinced that it could be put to good use somehow. 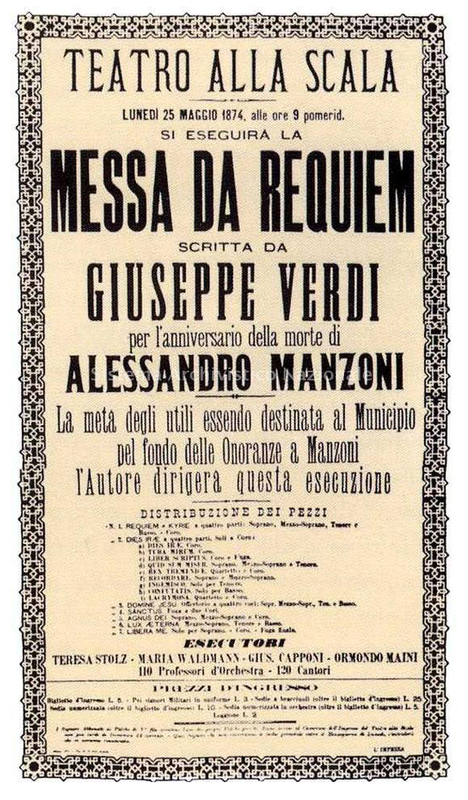 It took the death of another Italian artistic fixture in 1873 to make Verdi see that what he was really vying for was a requiem. A noted poet, nationalist novelist, and personal hero of Verdi’s, Alessandro Manzoni had just, upon hearing of his eldest son’s death, fallen and died on the spot. Verdi immediately recovered the mouldering Libera me from his stacks and breathed new life into it with a revision that inspired and later found a home within the pages of his newly conceived Requiem. 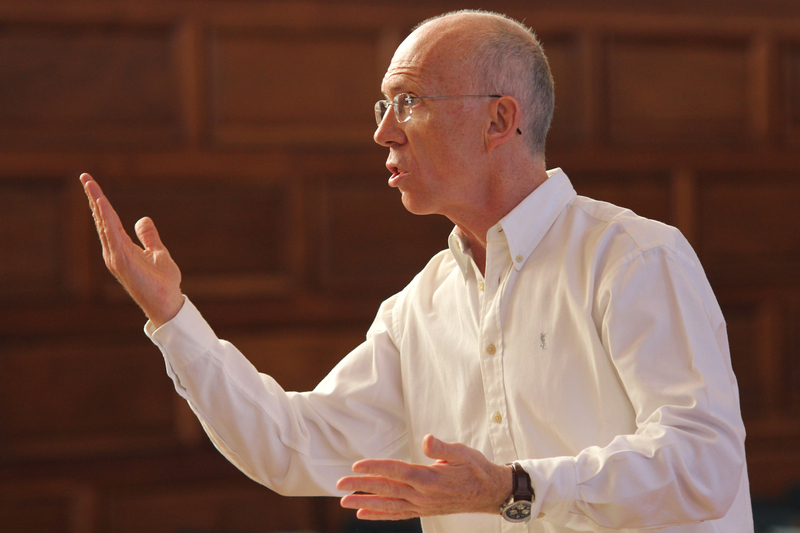 These negative attitudes notwithstanding, the Requiem has fascinated and moved liste ners and musicologists alike for years and shows no signs of doing anything otherwise for many years to come. So powerful was the Requiem that it was performed sixteen times by prisoners at the Terezin concentration camp during World War II. Led by interned conductor Raphael Schächter, a chorus of fellow imprisoned artists performed the piece, to the sadistic delight of the Nazis who considered it a great insult to force Jews to perform a piece with Roman Catholic roots. The prisoners, however, drew strength from their rehearsals and performances, and while the Nazis joked that they were “singing their own requiem,” the performers felt their voices had been returned to them, making the final Libera me something of an anthem. Musicologically speaking, there are few notable differences between the layout of Verdi’s Requiem and that of the typical requiem mass. Verdi did leave out the oft-used Gloria, a gesture that may or may not have been a reflection on his supposed agnosticism. The Verdi Requiem consists of the Introit & Kyrie, the ten-part Dies irae (“Day of Wrath”) sequence, the Offertory, the Sanctus, the Agnus Dei, the Communion and, of course, the Libera me sequence. The music of the Requiem is characterized by wild undulations. The composer moves from sparse, otherworldly vocals to brass-heavy inescapable brimstone and fire, and back again. Throughout, he uses the terrifying theme of the Dies irae to remind listeners of their inevitable mortality and judgment, all the while relying on wavering chromaticism to leave a sense of the composer’s own unresolved spiritual questions. While the Verdi Requiem has its unmistakably operatic moments, it is not, as one disgruntled critic once said, “an opera in ecclesiastical robes.” It is a work of far-reaching spiritual and emotional magnitude that at once pushed the religious music envelope and gave new meaning to the phrase “to each his own,” as evidenced by its cross-denominational/cross-cultural longevity and popularity. 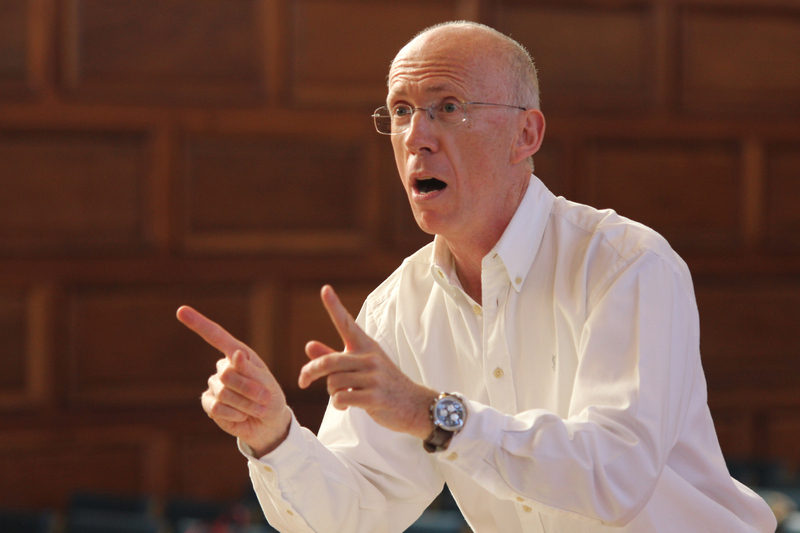 Other engagements include a concert tour of Rome, culminating in a performance of Fauré’s Requiem in St. Peter’s Rome and The Magic of Mozart for Devon Opera later this year. ung European Opera Singers’ Competition (La Scala, Milan) and finalist in the Kathleen Ferrier Awards, she has sung operatic roles throughout the UK and Europe and in concerts at all the major UK venues from the Royal Albert Hall to the Royal Concert Hall Glasgow with orchestras including the Royal Philharmonic, English Chamber Orchestra, Northern Sinfonia and London Mozart Players. 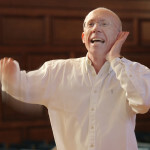 Engagements in recent years have included George and Matilda in Errolyn Wallen’s Cautionary Tales for Opera North, Fricka in Wagner’s Die Walküre and Waltraute in Götterdämmerung for Longborough Festival, a world premiere of Adam Gorb’s “Eternal Voices” with the Band of the Royal Marines narrated by Sir Trevor McDonald, Elgar’s Sea Pictures at Exeter Cathedral (EMG) and with Plymouth Symphony Orchestra, Mahler 8 at the Great Hall Exeter University and Siegrüne in Die Walküre with the Hallé under Sir Mark Elder which was broadcast on radio 3 and released on CD. 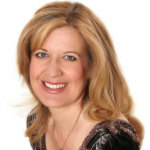 She has also covered Judith in Bartok’s Duke Bluebeard’s Castle and Marguerite in Berlioz’s Damnation of Faust for ENO. 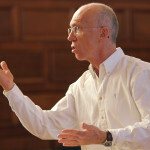 Other operatic roles include critically acclaimed performances of Charlotte (Werther) and Suzuki (Madama Butterfly) for Opera Holland Park, Donna Elvira (Don Giovanni) throughout northern Italy, Giraffe in ENO Baylis’ Early Earth Operas and Kate Pinkerton (Madam Butterfly) and Mercedes (Carmen) for Raymond Gubbay at the RAH. She has also premiered roles in Munich, Strasbourg and Berlin and covered Romeo in Bellini’s I Capuleti e i Montecchi for Opera de Montpellier. Her many oratorio engagements vary from the Bach Passions to Verdi Requiem and Elgar’s Dream of Gerontius. 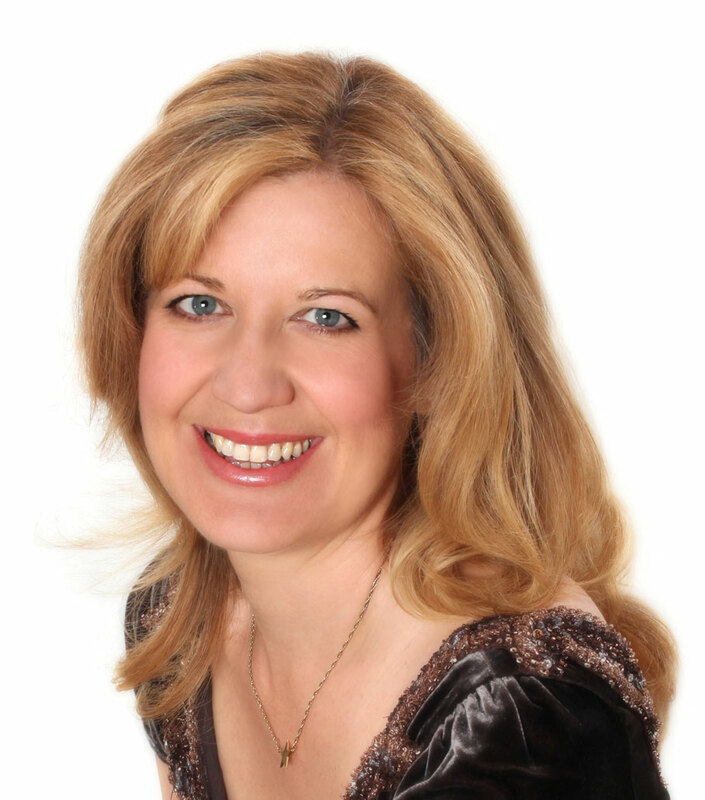 She has sung Mary in Berlioz’s L’Enfance du Christ with the Northern Sinfonia and has performed live on Radio 3’s In Tune. In 2013 she received universal critical acclaim for her performances as Fricka in Das Rheingold and Die Walküre and Waltraute in Götterdämmerung in Wagner’s Ring Cycle for Longborough Festival Opera. This was followed by a successful run of concerts of staged scenes from Verdi’s operas including Amneris in Act 4 of Aida for Devon Opera. 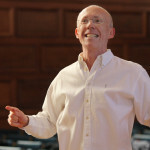 Recent engagements include Mozart’s Requiem for Ashtead Choral Society, The Dream of Gerontius in Taunton, Rossini’s Petite Messe Solonelle at Dartington Hall, Bach’s St John Passion at Bath Abbey, Brangaene in a concert performance of Tristan Und Isolde conducted by David Syrus with the Mastersingers, The Magic of Mozart for Devon Opera and Elgar’s Sea Pictures in Plymouth with the Ten Tors Orchestra. 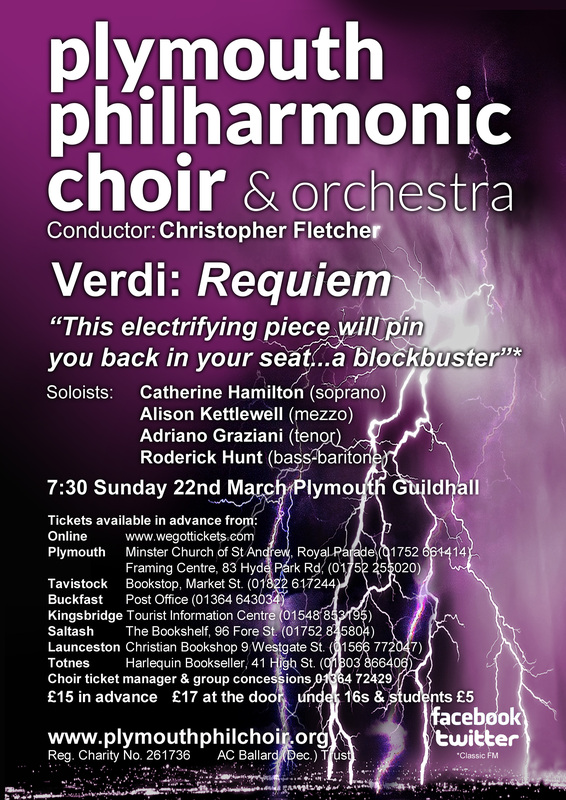 Future engagements include Elgar’s The Music Makers for the Three Spires Festival in Truro, Verdi Requiem in Guildford Cathedral, and Amneris (cover) in Verdi’s Il Trovatore for Scottish Opera. 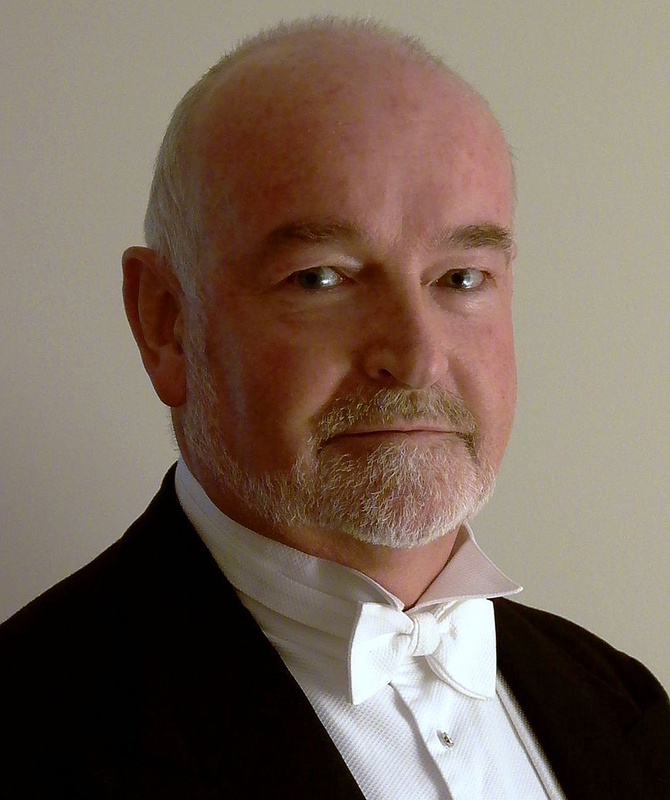 English tenor Matthew Minter studied singing at the Royal Northern College of Music. 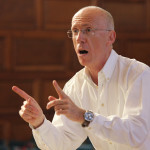 Renowned for his versatility as a soloist, Matthew is in demand throughout Britain and on the international concert platform and has received critical acclaim for his communication, delivery, and clarity of text. 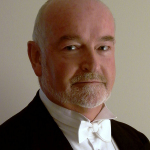 Matthew works regularly with many of Britain’s leading orchestras, including the English Symphony Orchestra, Northern Sinfonia, Royal Liverpool Philharmonic Orchestra and the Royal Philharmonic Orchestra. 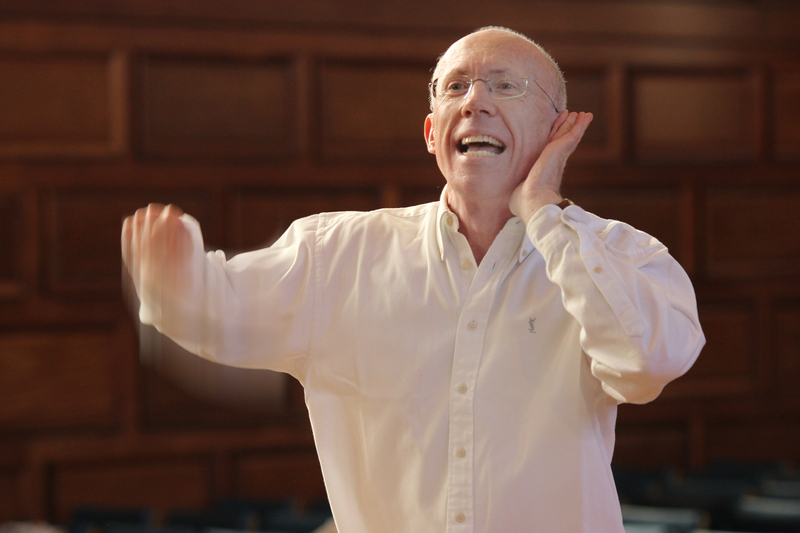 He has had the privilege of working under the direction of such distinguished conductors as Pierre Boulez, Sir John Eliot Gardiner, Bernard Haitink, Richard Hickox and Sir David Willcocks and he has performed at a number of the most prestigious venues including the Bridgewater Hall, Queen Elizabeth Hall, Royal Albert Hall, the Concertgebouw, and the Lincoln Center. 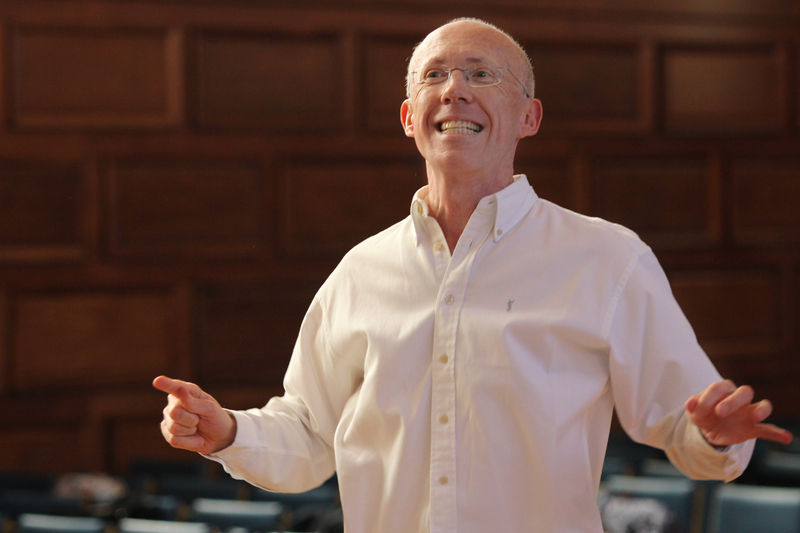 In 2013 Matthew premièred and recorded a Mass of Reverence and Devotion written especially for him by Daniel Gillingwater. Further career highlights include a gala performance for the British Prime Minister, singing at a private party for the Duchess of York and various members of the British Royal Family, and notably appearing on the BBC’s Top Gear programme performing O Sole Mio whilst being driven in a Maserati sports car by Michael Schumacher! 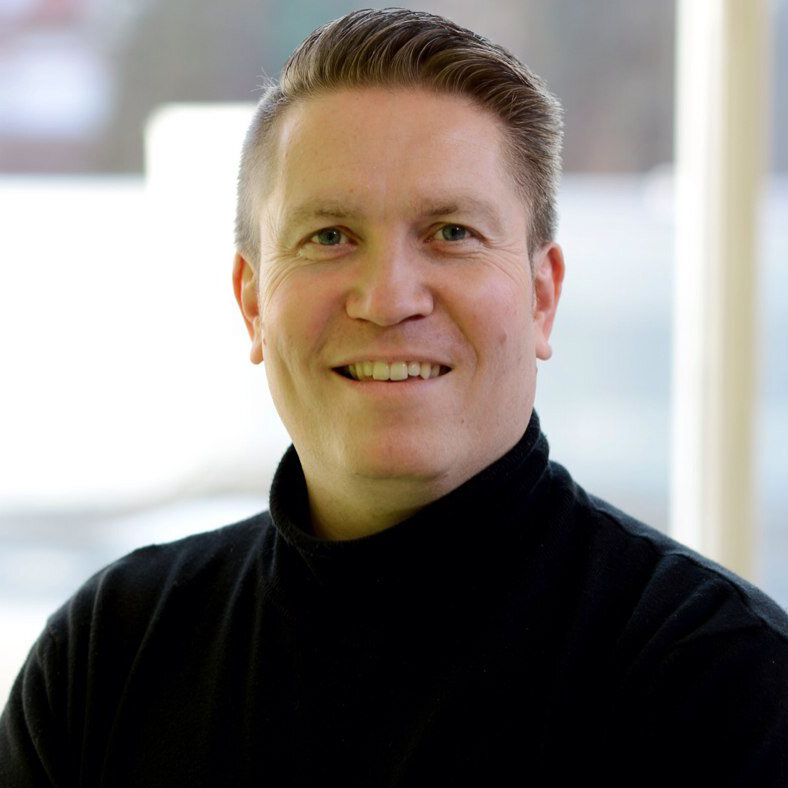 Rod is an opera specialist and a veteran of one hundred and thirty productions with regional companies in the UK, Europe and North America. His Verdi roles include Zaccaria (Nabucco), Sparafucile and Monterone (Rigoletto), Padre Guardiano (La Forza del Destino), Ramphis (Aida), Wurm (Luisa Miller), Grand Inquisitor (Don Carlo), Banquo (Macbeth) and the Requiem. In Puccini he sings Colline (La Bohème), Angelotti (Tosca), Bonze (Madama Butterfly) and Timur (Turandot). In Mozart his roles are Count Almaviva (Figaro), both the title role and the Commendatore in Don Giovanni, and Sarastro (Die Zauberflöte). In Beethoven he sings Don Pizarro and Don Fernando (Fidelio) and the 9th Symphony; in Rossini, Don Basilio (Il Barbiere di Siviglia), the Stabat Mater and the Messe Solennelle. Other roles include Seneca (L’Incoronazione di Poppea), Méphistophélès (Faust), Khan Kontchak (Prince Igor), Prince Gremin (Eugene Onegin), Daland (Der Fliegende Holländer) and various cameos in the works of Weill and Sondheim. Rod studies with Ian Comboy in Totnes.